It used to be that if you wanted the quicker version of a car, you’d order the one with three pedals and a row-your-own manual transmission. Today, however, it’s not unusual for the exact same car to be slightly quicker with an automatic or automated-manual transmission. Modern automatics’ torque converters tend to lock-up sooner than their “slush box” forebears, and shifts are getting very quick. Automated double-clutch transmissions especially shine for their directness, smoothness, and near-instantaneous shifts. Often, though not always, the gears’ and differentials’ ratios are similar between manual and automatic versions in the same car, so it’s typically down to shift speed. A tenth or two difference between them is what we expect to see for a 0-60 mph time, and that usually carries through to the quarter-mile time as well. 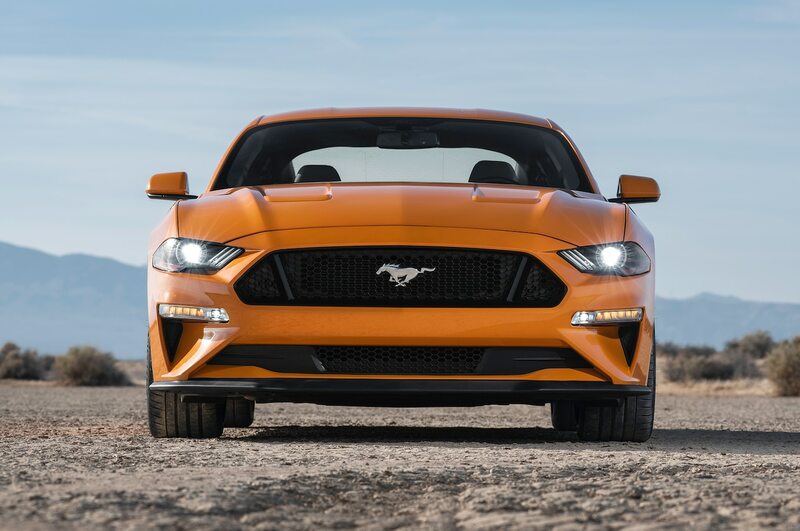 After testing two 2018 Ford Mustang GTs with a mere 3-pound difference in measured weight, we were taken aback by how much quicker the GT is with its new 10-speed automatic (10A) sixthan it is with a six-speed manual (6M). The launch performance can be measured from 0-30-mph times, and these are typically comparable. But this time we knew something was up: 1.9 seconds to 30 mph for the 6M and 1.7 seconds for the 10A; a two-tenths (0.2) difference out of the gate. By 50 mph, the 10A was 0.4 ahead, at 60 mph 0.5, at 70 mph 0.6, and at 100 mph, the automatic was a full second ahead of the manual. 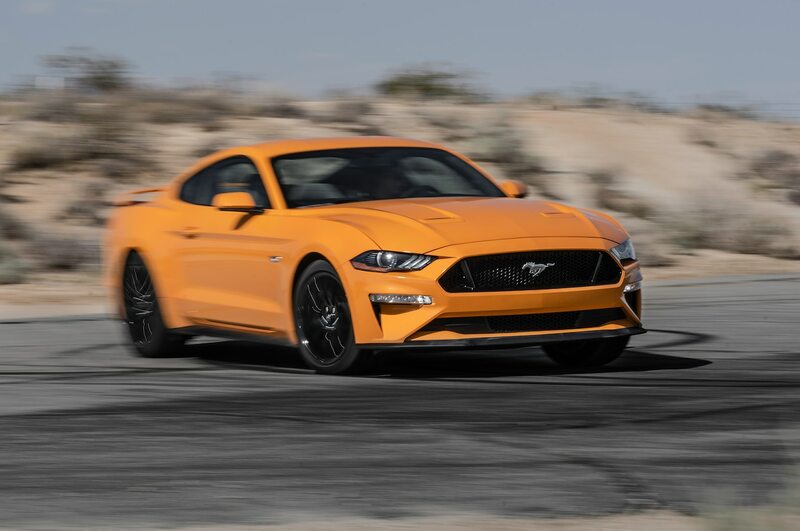 At the end of the quarter-mile, the 6M was in fourfourth gear and the 10A was in sixthsixth gear, and the 6M managed to claw back some time with a 12.6-second pass at 115.1 mph pass versus the 10A’s 12.1-second, 118.8-mph best. (See the acceleration graphs for the virtual race.) These differences cannot be merely explained by shift quickness or the automatic’s ability to stay “in the power band” more consistently–although that’s part of it. If you study the two transmissions’ gear ratios, both cars’ differential ratios, and do some math, you’ll discover, like we did, that the six-speed manual never had a chance. First, a little perspective. Remember your first time on a multi-speed bicycle when you discovered how much easier it was to pedal up a hill in firstfirst gear than it was in fifth? Or, do you remember forgetting to put it in first when you stopped, then you strained to start again in fifth gear? There’s a mechanical advantage in first gear, more “leverage” if you will, that makes it easier to pedal and to accelerate–to a point. At the moment you couldn’t pedal any faster, your “red line,” you selected the next gear, your pedaling grew slower, and the effort grew harder. Repeat for as many gears as there are, and eventually, you’d theoretically find your top-speed of that bike. Now, imagine two multi-speed bicycles: a six-speed and a 10-speed where the two bikes’ top gears are the same, meaning sixth gear on the six-speed equals tenth gear on the 10-speed. In other words, you’d be pedaling at the same cadence and going the same speed on both. Yet, all the gears below their top gears are chopped up into different sized “jumps” between. On the way to that same top gear, there are five larger jumps between the six-speed’s gears than the nine of the 10-speed. Following me? 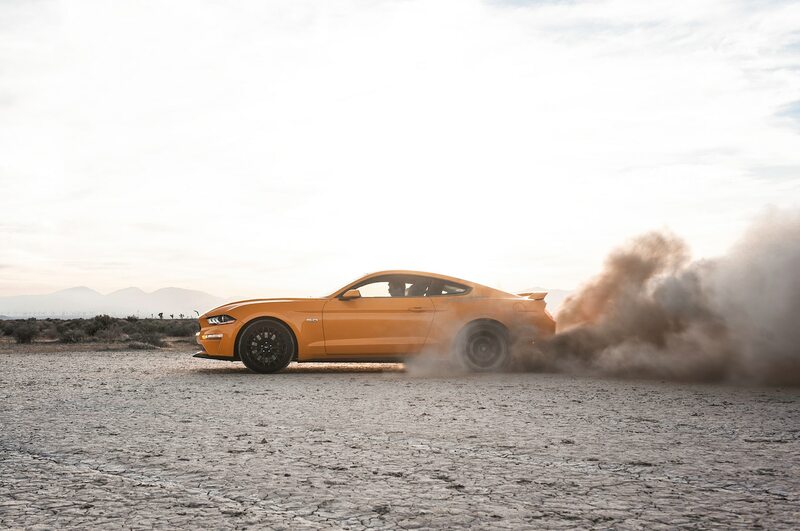 Back to the Mustang GT six-speed (manual) and 10-speed (automatic), which also have effectively the same top gear. (Technically, they’re 3percent different, but that translates to a tachometer needle-width, or just 50-rpm difference at 60 mph.) Like those bicycles, each jump between gears is smaller with the 10A than the 6M, so their tachometers swing through different ranges and at different times with each upshift. The one that keeps the needle between the peak-torque rpm (4,600) and peak-horsepower (7,000) more consistently will exploit its engine’s “power band” more effectively. In this case, the 6M falls in and out of this optimal window more often than the 10A does. The 10A is in the engine’s sweet spot more consistently while accelerating. Yet, besides this time-in-the-power-band advantage, the 10A is also helped by its combination of transmission gear ratios and its differential (rear-end) ratio. Like a cleverly chosen block and pulley, together these values/combinations provide a mechanical advantage over the 6M. We can see this by how much force each cars’ combinations produce at the pavement. Using the same 420 lb-ft of torque available at 4,600 rpm (soon after they leave the starting line in first gear), the 6M generates 2,200 pounds of force at each of the tires’ contact patches meet the pavement to the 10A’s 3,038 pounds on identical tires—an advantage of 838 pounds of force per tire at that particular rpm. The 10A’s mechanical advantage carries through with each upshift, varying between 400 and that initial 838 pounds of force as the tachometer passes over that same maximum torque rpm at 4,600. There are some interesting parallels that happen along the way, however. For instance, in the 6M’s third gear and 10A’s fifth gear, they both send just under 1,000 pounds of force to the pavement at 4,600 rpm (and both gears max out at 109 mph). A similar coincidence happens at a theoretical 194 mph where the 6M’s fifth gear hits redline, and the 10A’s eighth gear tops out. 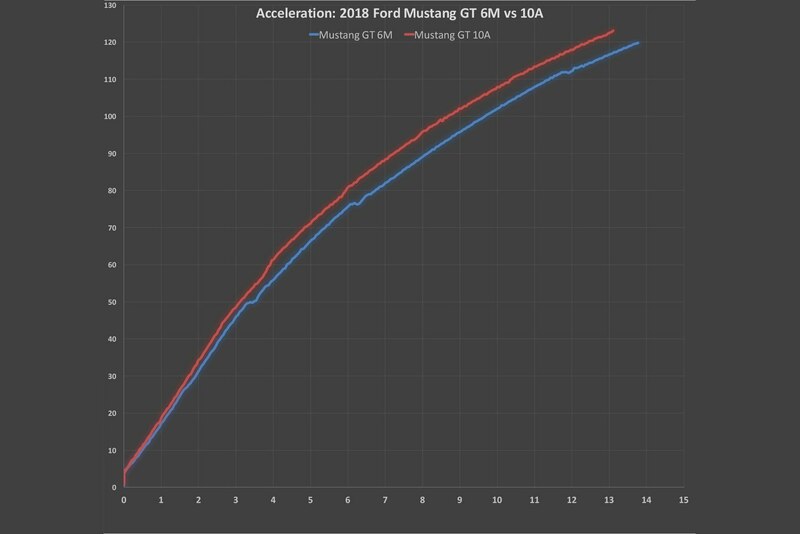 Might this be a hint to the upcoming Mustang Shelby GT500’s top speed? If it’s better to have more gears, where are the eight-, nine-, or 10-speed manuals? Too much time lost rowing that stick instead of accelerating. Torque interruptions on modern conventional and twin-clutch automatics are almost imperceptible. Look again more closely at the graph and just try to pick out the shifts on the 10A’s red curve. Here’s a hint: 35, 55, 77, 94, and 109 mph. 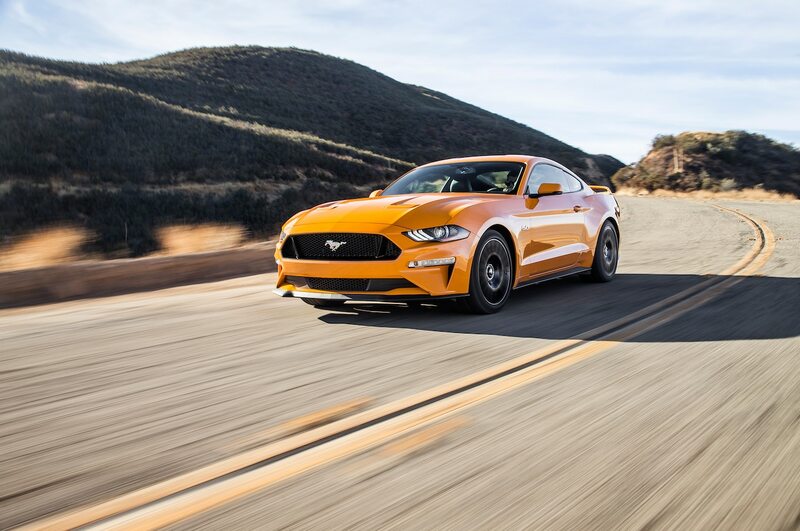 Unlike automatics of the past, the Mustang GT’s new 10-speed automatic gets past that hurdle plus it exploits mechanical advantages over the six-speed manual to boot. So there you have it. It might be sacrilegious for an automotive enthusiast, but if you want the quicker 2018 Mustang GT, that would be the one with the automatic.